DPR | Park View, D.C.
On Wednesday March 7th, representatives from the Department of Parks and Recreation met with neighbors to discuss the annual Ty Hop Basketball Tournament. The basketball tournament has been held at the rec center since 2002, with no tournament in 2016. It was clear from the start that DPR is committed to continuing the tournament, but are open to feedback on days of the week, times, and length of the tournament (six weeks instead of 8 weeks?). Unlike years past, this year they are focusing the tournament for ages 15 years and younger instead of ages 24-40. DPR has stated that they will organize a follow up meeting in 3-4 weeks to continue to work with the community on additional details for the tournament. As in years past, the meeting centered on the need for a public safety plan in the community and concerns about gun violence. This is something that all in attendance who spoke up stressed — whether they were in favor of the tournament or not. Disappointingly, while MPD officers attended the meeting, they largely observed and offered very little, event when asked directly for their input. The meeting, which began at 7 pm and wrapped up around 8:30 or so, was at times heated and emotional — with some citing the tournament as a valuable experience that helps bring people together and break down racism and bias — to others expressing concern that directly or indirectly gun violence has occurred around and near the rec center during tournament times and that no one should have to teach their children to duck and cover — and others still expressing that the tournament has a long history in the neighborhood and that those who have moved to the neighborhood need to accept that this is part of the community and to not push it out. In my opinion, DPR can do a better job when it comes to working with the community to organize events. Here are three areas where I believe DPR has dropped the ball. An annual basketball tournament is fine and should be a community building event, however DPR continues to strike me as focusing only on being responsible for what happens on their property and relying on the community or MPD to control what occurs off their property. Technically, this may be where the responsibilities are, but we need to have a collaborative and integrated public safety approach for events that draw larger numbers of participants for longer periods of time. This is no different than other large events in the city whether it be the Funk Parade or a city festival. DPR repeatedly stated the longevity of the tournament as its justification for its continuation. As the tournament continues to have a large number of participants I can agree a basketball tournament still has value. However, the neighborhood has also changed a lot since 2002 when the tournament first began. Park View is far more diverse with many young families that equally value other activities. DPR needs to change and adapt along with the community — meaning that basketball should no longer be the only event at the Rec Center. Today the Rec Center needs to do this with a diverse summer program of actives. I don’t see DPR taking the lead on this. DPR needs to listen. Neighbors do advocate for activities they would like to see at the Rec Center in addition to what is offered now. For the past couple of years parents have repeatedly asked for the small children’s pool to open earlier on Saturday, and I sent Directer Anderson a letter to that effect from ANC1A last year. Similarly, when former Mayor Fenty and Councilember Graham first proposed to renovate Park View Rec Center’s baseball field with a new artificial turf baseball field in 2010, I pointed out that no one in the neighborhood played baseball and led neighbors to push for neighborhood servicing improvements which were delivered in 2012. DPR’s failure to listen before they make decisions sets up a contentious and divisive process before their first conversations with the community even occur. This needs to stop. Ultimately we need a DPR that is a true community partner. One that is responsive, one that is engaged, and one that values the diverse and ever changing needs of every neighborhood. Park View Movie Night Scheduled for September 16th! UPDATED: The time and choice of movies have been updated as of 9/12 @ 3 pm. 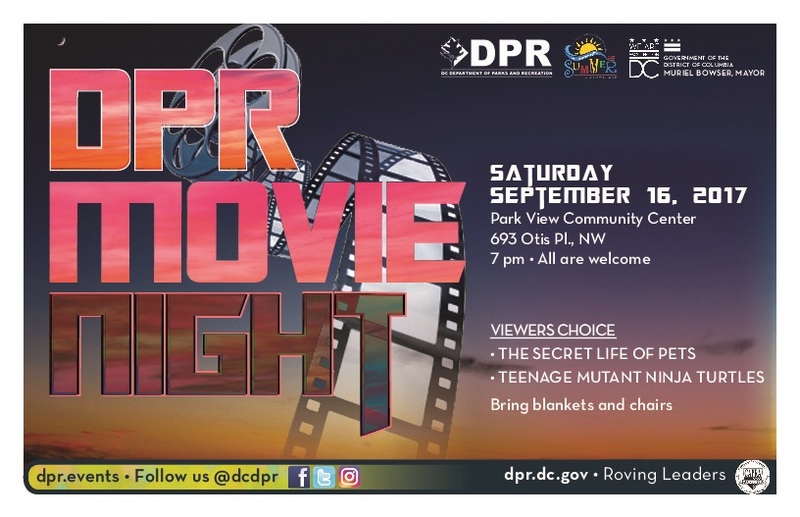 To close out the summer, DPR has scheduled a Movie Night at the Park View Recreation Center on Saturday, September 16, beginning at 7 pm. Where do you take your dog to walk, run, socialized with other dogs, and just have a good time being a dog? 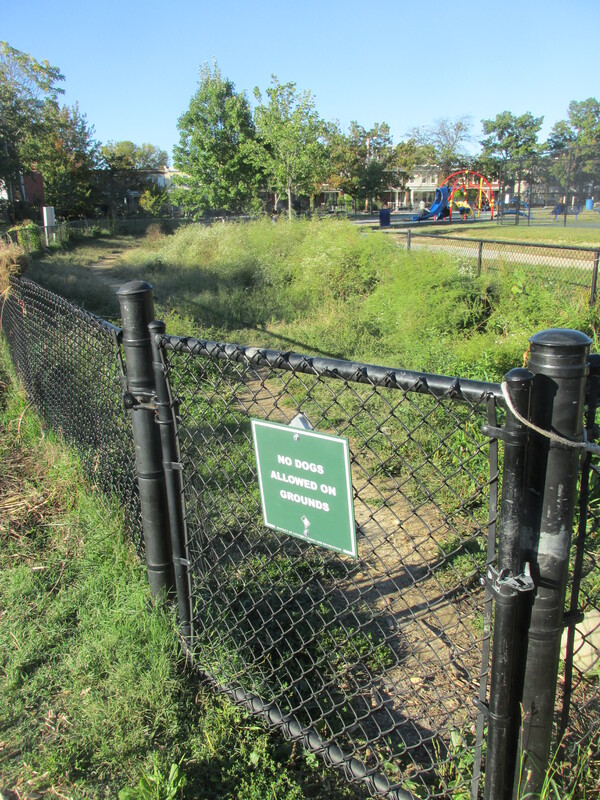 The area at Bruce Monroe Park closed to dogs recently. ANC 1A10 Commissioner Rashida Brown is working to schedule a community meeting to sort this out, and I certainly support her efforts. While the short term outcome may indeed be to restore access to the fenced in area, that won’t solve the problem in the long-term. This all leads me to ask, whether at Bruce Monroe Park or elsewhere — Where do you take your dog to walk, run, socialized with other dogs, and just have a good time being a dog? I’ve seen dogs playing at Wangari Gardens, at the triangle park at Rock Creek Church Road and Park Place, and at the unofficial dog park at 11th Street and Park Road. However, with no official dog parks in the northeastern corner of Ward 1, what spaces have you found that provide a safe environment for your dog to exercise and play with other dogs? 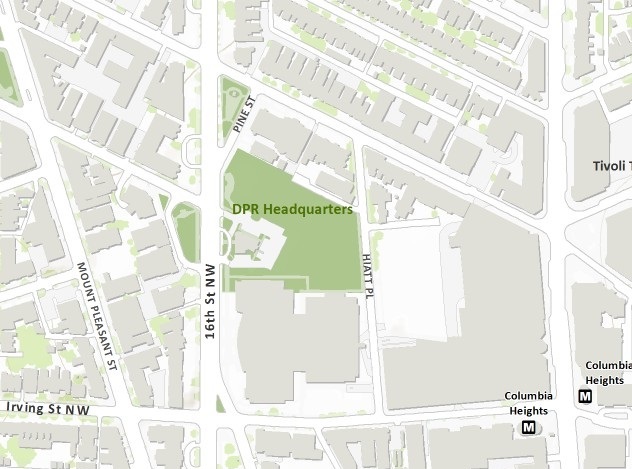 In reviewing DPR’s recently released Play DC Vision Framework Document, I began to reflect upon the former DPR Headquarters property located at 3149 Sixteenth Street, NW, and the adjoining park to the north. 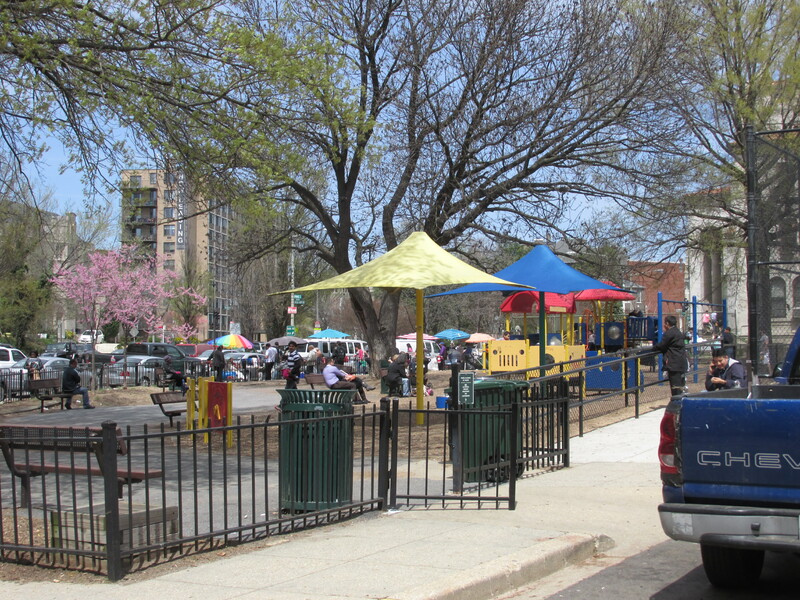 The DPR Website refers to the playground as the 16th Street Playground, although historically it was known as either the Powell Recreation Center or the Johnson-Powell Playground after the two schools that were once located on the neighboring properties. Both schools are now long gone and been replaced by the Columbia Heights Education Campus to the south. But, back to the parkland and building. DPR moved from the 16th Street property t0 their present U Street location in 2012 leaving the building empty. The neighboring park was last renovated in 2011 and seems well used and popular when I walk past it. However, both properties appear to fall far short of their potential and a review of the Vision Framework doesn’t seem to give them any particular importance (although that could change between now and the final master plan). The landmark building, listed on the National Register in 1986, is large and could accommodate any number of functions — from office space on the upper floors for non-profits, to gallery space for rotating art, photography, and history exhibits, to being one of the few publicly accessible meeting spaces in Ward 1. The parkland is relatively large, and while the playground and tennis courts are popular, the baseball diamond and large grassy area in the back are lesser used. They were completely empty last time I visited, but I’m betting the Columbia Heights Education Campus makes good use of them. I’ve begun to wonder if outdoor lighting and an upgrade would make the baseball diamond a more attractive amenity for both the nearby Bell Multicultural High School and the greater community. I also wonder if there is enough room for some additional uses if the playground and building site were better integrated. 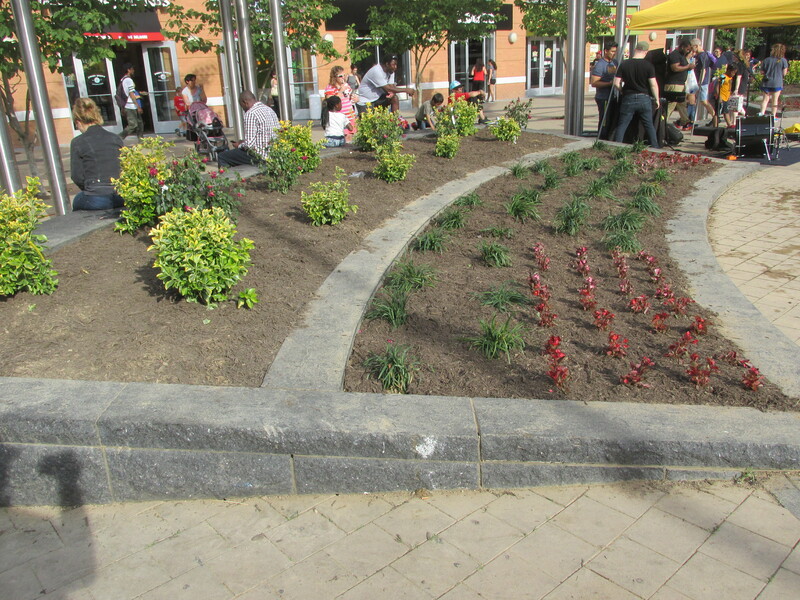 Perhaps there would be room for a community garden or some other recreational amenity that is otherwise lacking in the surrounding community. 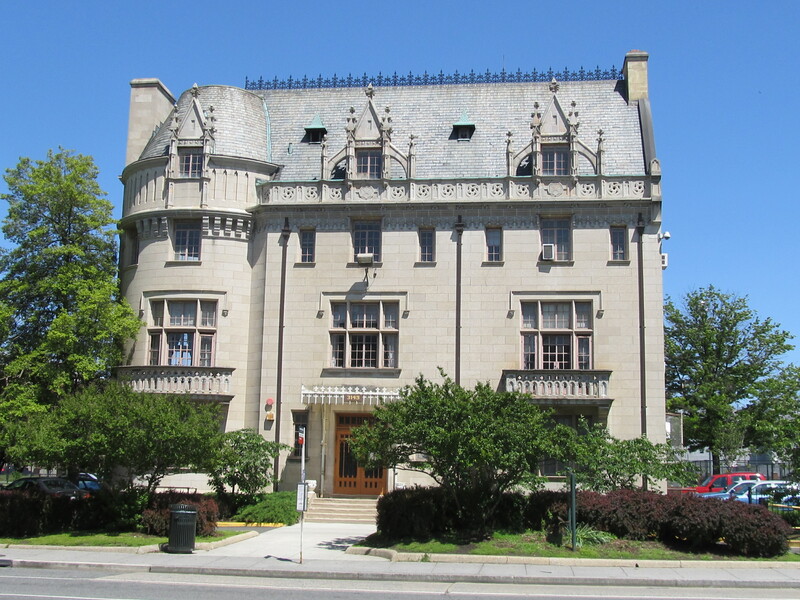 The Chateauesque Embassy Building No. 10, former headquarters of DPR. While identifying programming and building community consensus may seem like the most obvious hurdles to improving the property, they aren’t the only ones. The properties are among the many in the District of Columbia that are still technically owned by the Federal Government, but whose jurisdiction & maintenance has been transferred to the District of Columbia. A significant aspect of this duel scenario is that the Federal Government transferred day-to-day operations of the properties to D.C. with a restriction that the properties must be used for or support recreation purposes. 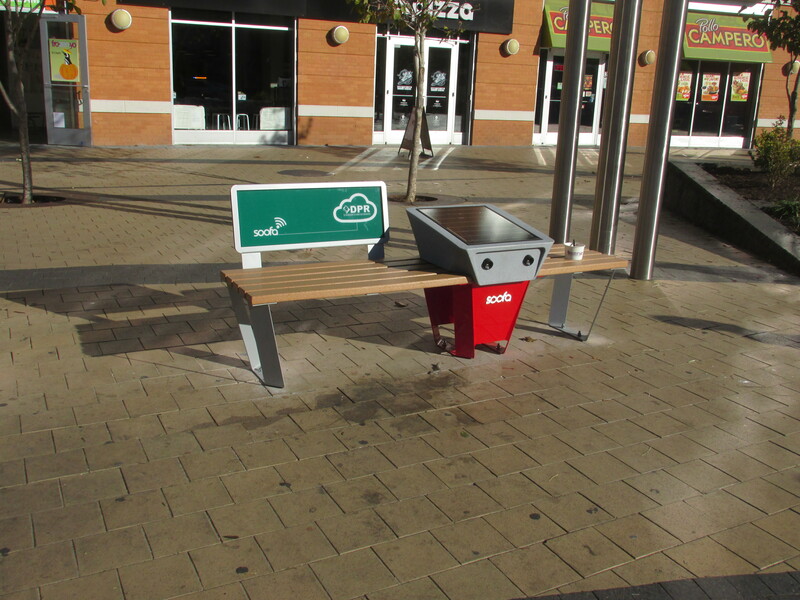 This poses less of a problem for the outdoor spaces, but it does restrict what the building can be used for. This, no doubt, has played a role in the building’s current vacant status. The building is also in need of significant repair and upgrades — and I would imagine that restoring a building it doesn’t own or currently use is low on the District’s list of priorities. Yet, I think that if the community were able to come up with a good plan and vision for both the building and the parkland, funding of that vision could be found — and perhaps some of that funding could come from the Federal Government. A good example of this is a short distance to the south, where after successful outreach Meridian Hill Park is in the midst of improvements from the National Park Service. Hopefully, people have been following the Play DC initiative. Play DC is the District of Columbia’s Parks and Recreation Master Plan Initiative (Web site here). The initiative completed the Vision Framework Document in March, leaving both the Implementation Strategy and Master Plan outstanding (see process map above). Progressing citywide goals identified in Mayor Gray’s ONE CITY Action Plan, including economic strength and diversification, education and workforce preparation, sustainability and quality of life. 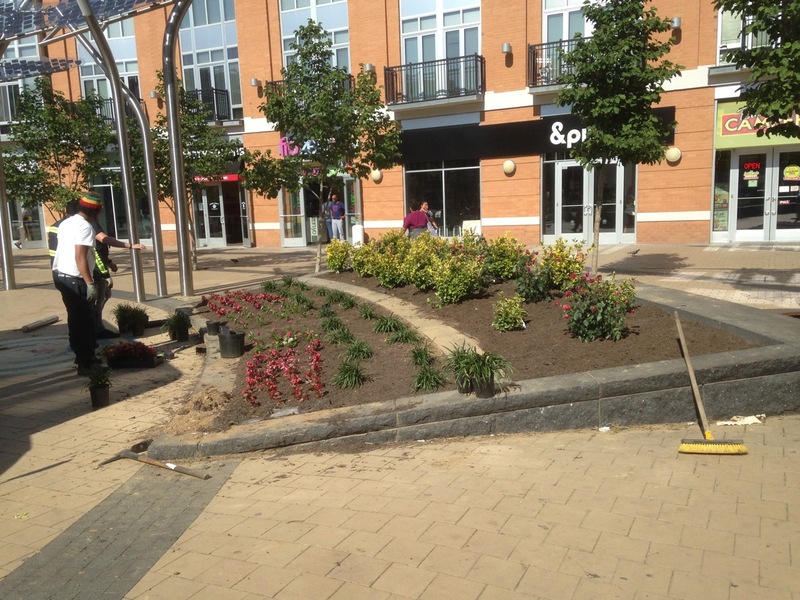 Increase natural features on DPR properties, such as trees, gardens, or wetlands, by 40%. It will be interesting to see how these targets and details are represented in the Implementation Strategy and Master Plan when they are completed. 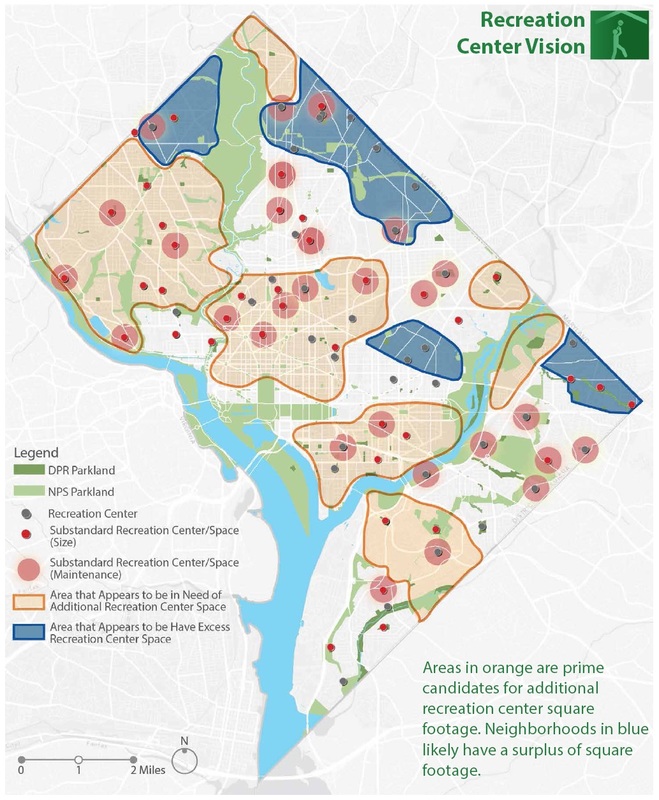 For example, the image below is a map that shows how recreation centers stack up. A quick review of the map shows that the Park View Recreation Center (for example) is among those that is considered substandard in both size and maintenance (though the Park View community is not within an area in need of additional recreation center space). While the Park View area may not need additional recreation center space, another map in the Vision Framework does include the community — along with much of Ward 1, Ward 5, and southern Ward 4 — within a large area in need of more parkland. 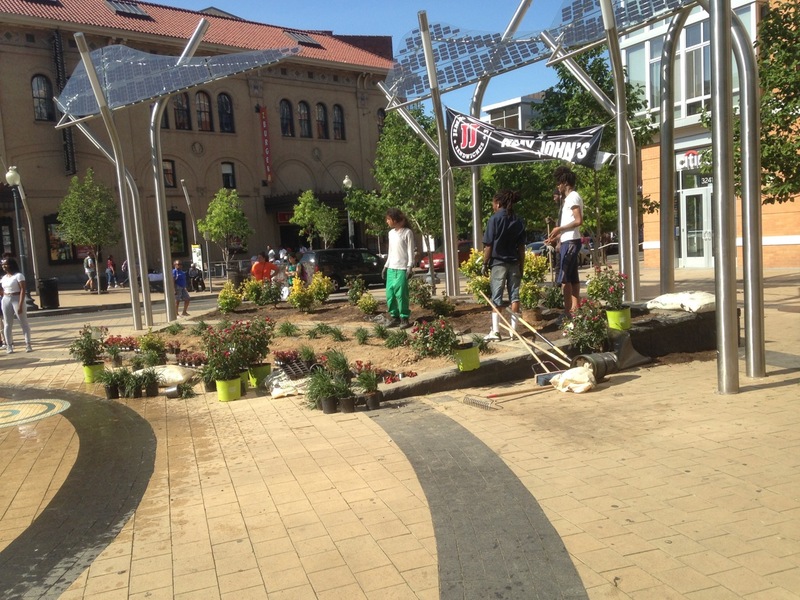 Both the Play DC Web site and its Resources page are worth a look to see where we might be headed with the District’s greenspaces over the next decade.